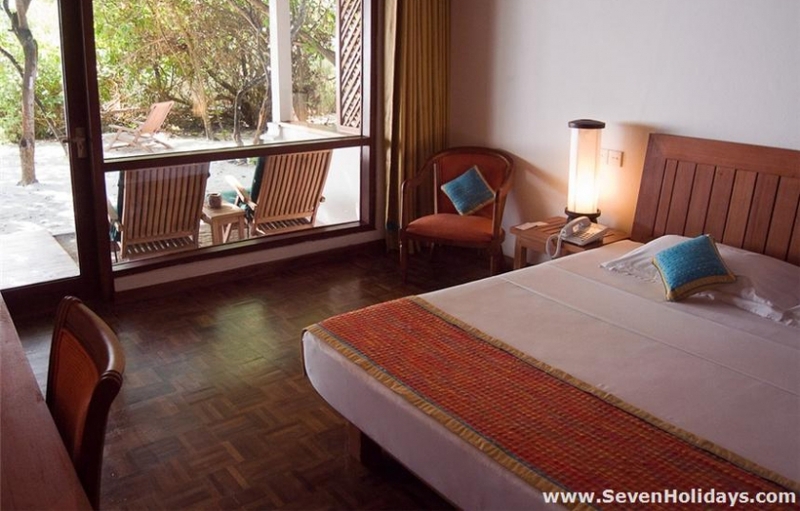 Reethi Beach is a lovely, all-round resort. 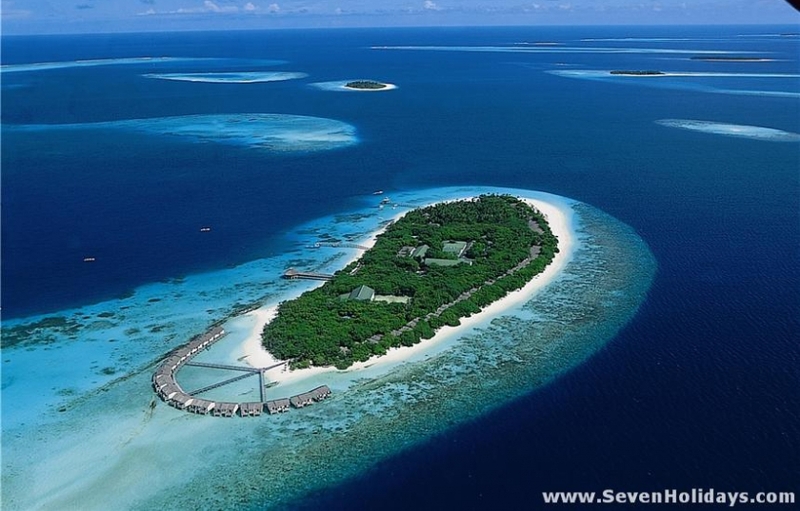 One that scores well in just about every aspect of what makes Maldives resorts special. And, with outstanding management, it keeps getting better. 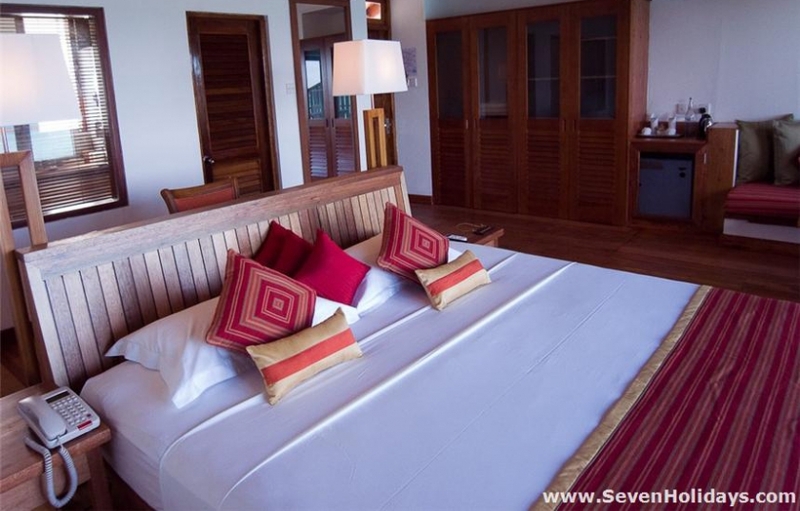 A major renovation in 2010 delivered a modern comfortable chic, echoing the style of Soneva Fushi, its neighbour. Tasteful wooden furniture backs a vibrant colour scheme based on a flower of a native tree: yellow on the bow turning to orange with a deep red when on the floor. The look and feel blend perfectly with this resort island, one of those most blessed by nature and, as reflected in the Green Award granted by Kuoni, committed to disturbing it as little as possible. Over 4,000 trees are protected and never sprayed. Their leaves are allowed to remain on the ground, merely swept aside from the sandy paths. The resorts in Baa Atoll have a model association where environmental best practices are discussed and put in place. 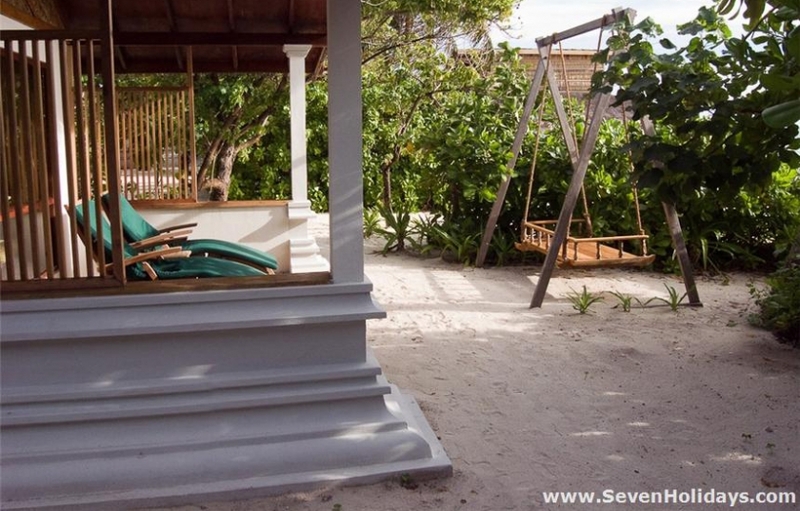 On Reethi Beach, there are many green initiatives, from waste disposal to glass bottles, heat exchanging and biogas generation. Both here and on Soneva Fushi there is no sunset fishing as this denudes reefs of fish needlessly. 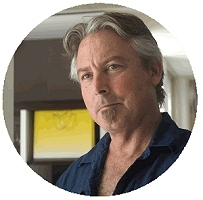 Furthermore, efforts are being made to actively protect the sharks from fishing. The beach is very good most of the way around the island and particularly good on the west side, where the Reethi Villas are and at the southern end, where the Deluxe Villas are. At the other end is a bulge of sand behind the Water Villas. This is a bonus, especially as there are loungers with umbrellas and a hut bar open all day. However, it is fortunate the beach is nearby as only the rooms at the ends of the semicircle catch the sun, the others face north. These villas have been greatly improved with steps down thelagoon from the deck and doors that fold all the way open for a full vista of sea and sky from the bed. The interior decoration has quality furniture and richly coloured textiles of auburn and gold. The deluxe villas are slightly better, facing the sun most of the day and just a few steps from a fine beach and good snorkeling. 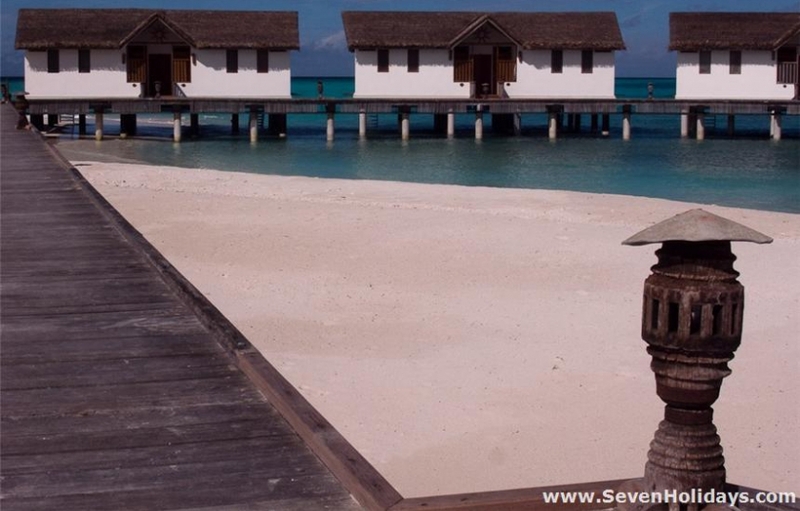 However, the water villas are more private. These rooms are quite close to each other but they are partly screened and not in a line, so privacy is good. 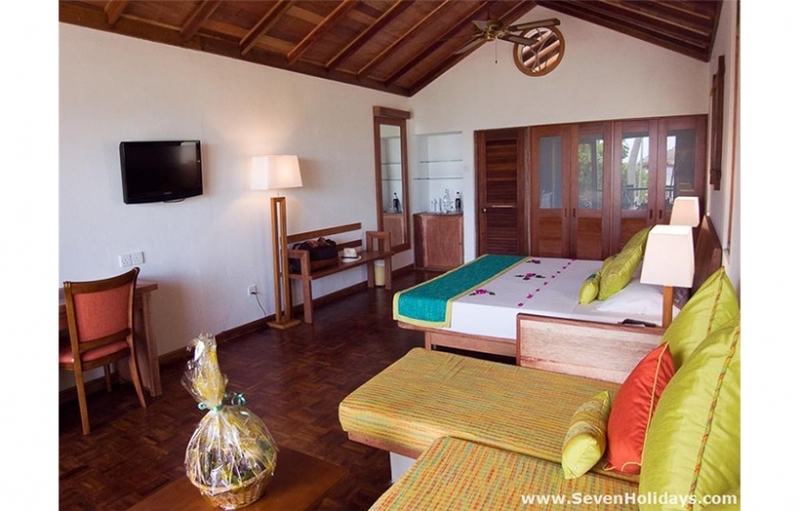 The Reethi Villas are the standard rooms and they are noticeably less smart. 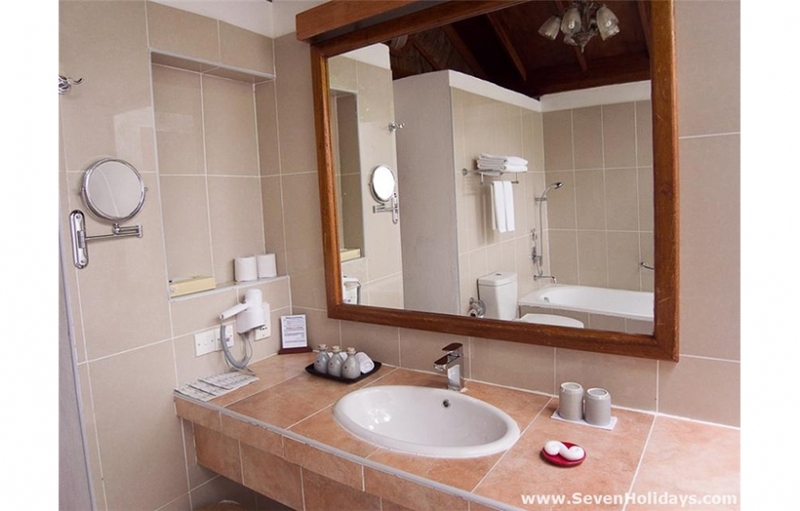 They are smaller, the furniture is not as well made and there is no verandah, though the bathroom is clean and light. 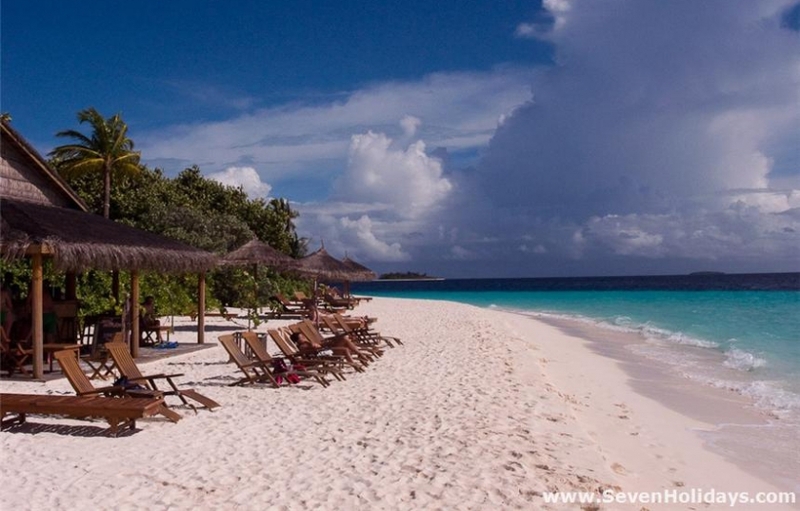 Reethi Beach could be called quietly active. The general air is unhurried but there are far more options for action here than on most resorts. 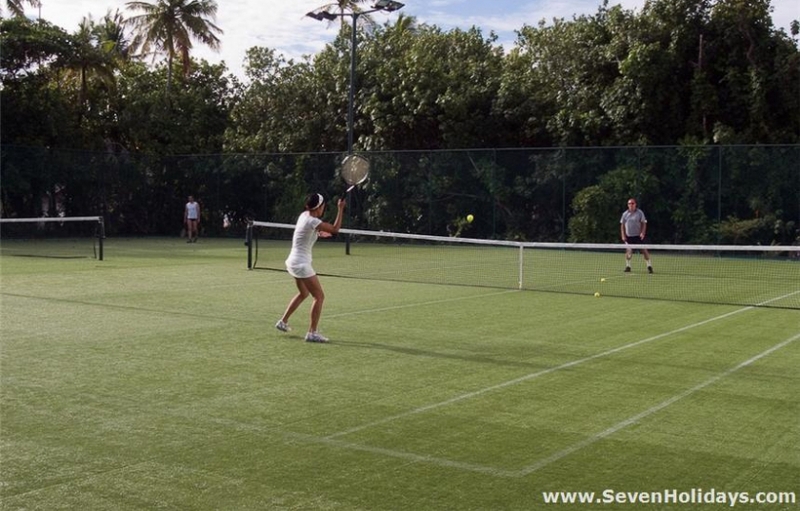 2 tennis courts abut the indoor sports complex that has 2 squash courts, 2 badminton courts and a gym. Staff members give lessons and are available to play against you. The complex opens out to a small swimming pool. Off the main bar there is table tennis and table football and round by the beach bar, a daily volleyball game. The watersports centre, prominently position on the beach, is active and very well stocked. This is one of the few places you can try out kitesurfing. Sailing or windsurfing trips go to one of several nearby sandbanks and desert islands. The resort looks after 4 desert islands that are also used for 1-couple-only Robinson Crusoe picnics. Alternatively, you could go to the Coconut Spa. Nothing much to look at maybe but all reports are that the Balinese therapists are superb and the prices, as everywhere here, are reasonable. The cuisine in all the outlets is remarkably good, especially unusual as up to 50% of the guests are on all-inclusive deals. The main restaurant offers a different lunch buffet every day for a fortnight. As an example of quality, the parmesan cheese is an real block from Parmesan, freshly grated. 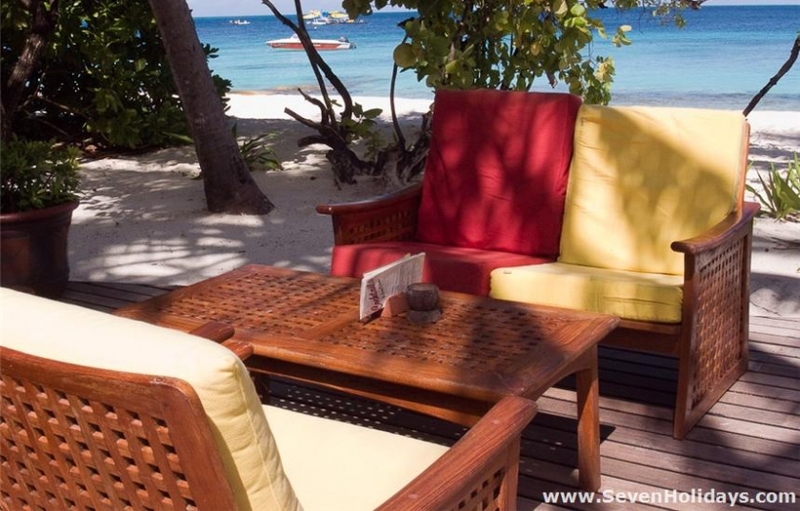 The 2 specialty restaurants, The Grill and Moodhu over the water, haven’t quite found their true raison d’être but are ideal for having the occasional night alone together away from the buffet. A highlight for many here is the diving . Around a third of the Europeans who come here go diving and that’s as high as anywhere. With few resorts in the atoll, the many sites are still fresh and relatively unvisited. 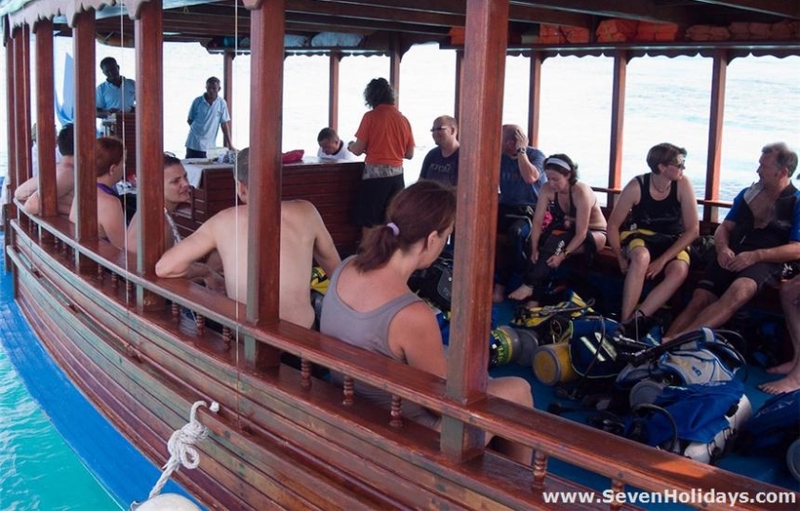 The dive centre is great, organising up to 4 dives a day, including the housereef diving. Many of the sites are illustrated in their terrific souvenir logbook. The great new discovery of hundreds of whale sharks and mantas at Hanifaru is a massive bonus in the months of August and September especially. 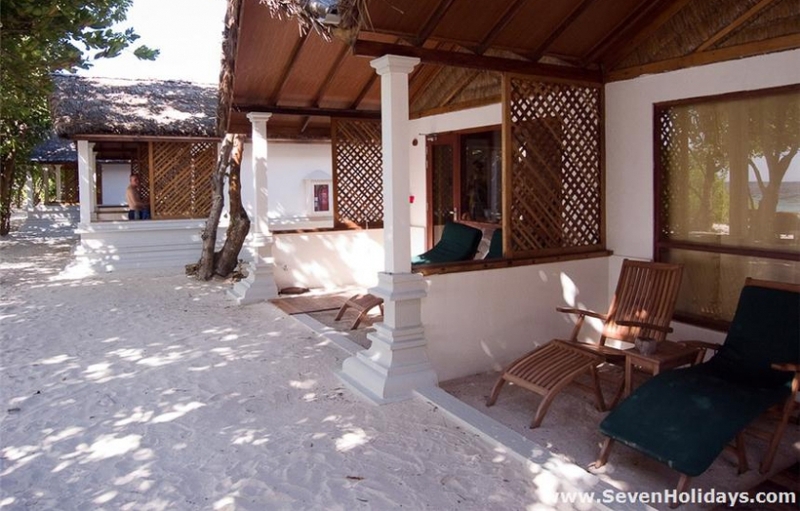 All in all Reethi Beach is now one of the very best resorts in the middle bracket.